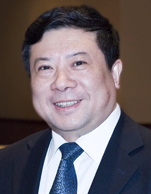 Mr. Zhang Ye is the President of Shanghai Shipping Exchange and the delegate of Shanghai Municipal People’s Congress. He graduated from Wuhan University of Technology and got the MBA degree of Shanghai Jiaotong University and PhD degree of Shanghai Maritime University. He had many years of sailing experiences in charge of navigation engines and ship technology and management, having supervised building and maintenance of passenger ships, tugboats, leisure boats, bulk carriers, multi-purpose container ships, etc. Besides that, he had abundant experience in operation and management of domestic and foreign trade transport, operation and management of container fleet, supervision and management of shipbuilding technology and management of shipping-related service enterprises. He had obtained the title of Senior Engineer early in 1996 and now his primary businesses are shipping finance, trading, information, etc. Zhang is the guest professor of Dalian Maritime University, Shanghai Maritime University and the College of Business of Shanghai University of Finance and Economics, the Consulting Expert of Free Trade Zone Legal Institute of East China University of Political Science and Law, the Deputy Director of Municipal Promotional Panel Office of Shanghai International Shipping Center, the Deputy Chairman of Shanghai Port Union, the Deputy Governor of Shanghai International Shipping Institute, the Director of Shanghai Navigation Academy, the Member of Shanghai Arbitration Commission and the Consulting Expert of News Agency Consultants Committee of MOT. He was awarded the honor of Shanghai Municipal Leading Talent, Top 10 Finance Leaders in Shanghai and selected as the Top 100 Most Influential People of Shipping Sector by Lloyd's List consecutively in 2010-2013 and 2015. In 2012, he was also awarded the honor of Top 10 Most Influential Shipping People in China. He works as Shanghai Conference Ambassador since 2013.